Congratulations, you’re getting married! Now what? Well, for starters, no couple can get married in the Commonwealth of Pennsylvania without a valid marriage license. There are two types to choose from. We’re here to break it down for you so that you are prepared for the application process and all that comes with it. A traditional marriage license is what most people think of. It requires an officiant to solemnize the marriage as defined under Pennsylvania law. 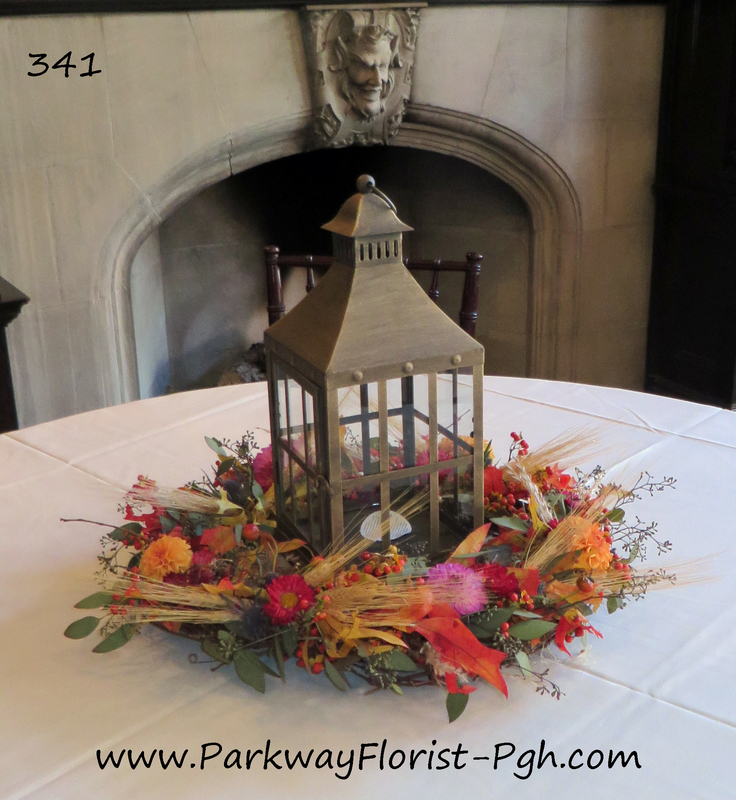 Your Officiant must be licensed in the Commonwealth of Pennsylvania in order to perform your ceremony. After your ceremony, your Officiant will usually sign the marriage license and handle the recording with the Marriage License Bureau for you. A self-uniting license is more uncommon, but growing in popularity. It has been around historically since the time of Quakers in Pennsylvania and does not require an officiant. The couple generally recites vows to each other, that they have written, uniting in marriage on their own, either as part of a self guided ceremony or privately if they wish. After the couple have recited their vows to each other, two witnesses who are present at the ceremony sign the license. The couple is then responsible for mailing the license to the Marriage License Bureau for recording. In Pennsylvania, there is a mandatory three day waiting period for all couples from the time that they apply for their license to when it is granted. It is best to apply for a marriage license two to three weeks prior to your scheduled wedding ceremony. Once the license is granted, it is valid for up to sixty days. To apply for a marriage license, both applicants must complete the application (either online or in person) and both must appear in person at the Marriage License Bureau to complete the application process. Once your application is accepted, the applicants must wait the mandatory 3 days until their marriage license is available for pickup (or it can be mailed.) (There are some exceptions that can apply in certain cases, such as a medical issue. Please check with the County Marriage License Bureau for further guidance). The information above applies to all counties in the Commonwealth of Pennsylvania. The cost of a marriage license can vary from county to county, however. Please check each county’s website for costs and hours of operation for the Marriage License Bureau in that county. 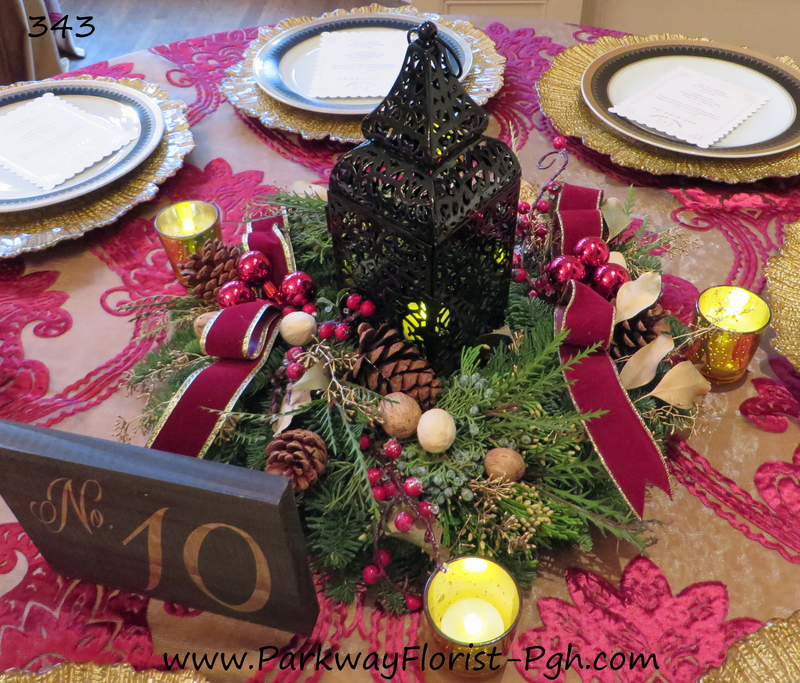 This entry was posted on January 25, 2018, in Weddings - 2018 and tagged 2018 Wedding Season, Marriage License Types, Marriage Licenses 2018, parkway florist pittsburgh, parkway florist wedding flowers, Pittsburgh Marriage License, Pittsburgh PA, Pittsburgh Weddings 2018, wedding flowers, wedding flowers pittsburgh. Petals line the isle, the guests have all arrived, the smell of fresh flowers fills the air, all is set for a romantic garden wedding ceremony. Our pipe and drape created the perfect backdrop for this sweet ceremony. Threatened by rain, their love prevailed and the ceremony was able to take place outdoors at one of our favorite venues. 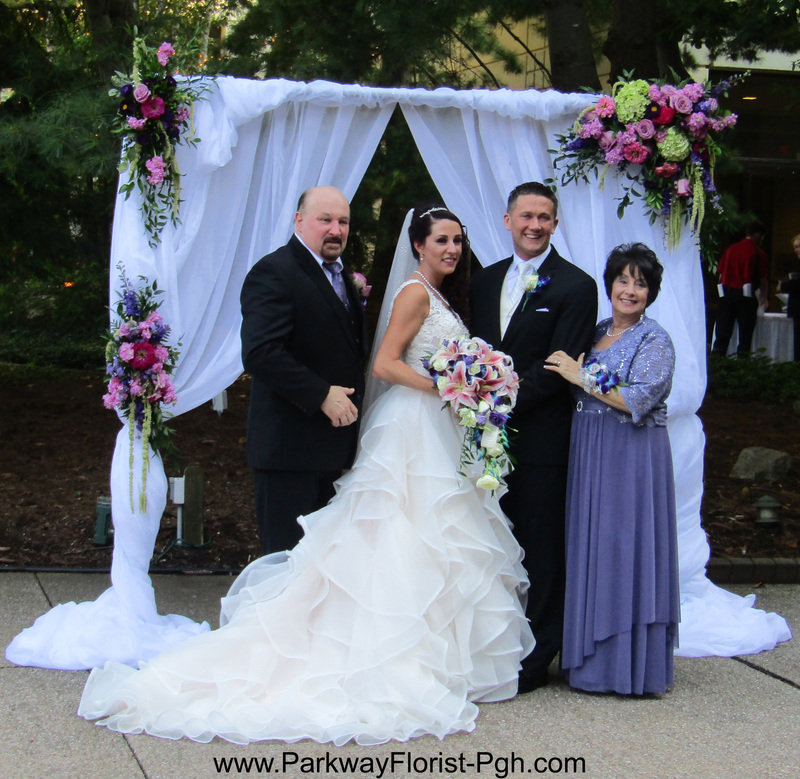 Danielle carried a cascading bouquet of stargazer lilies, dendrobium orchids, purple lisianthus, and white roses. The isle was decorated with rose petals and flowers clusters on the ends of the seats. This provided a nice pop of color as the bride walked down the isle. After the ceremony concluded, family pictures were taken in the garden while the guests moved inside to cocktail hour. Danielle’s bridesmaids wore deep purple dresses, perfect for their August wedding, and a great contrast to their bouquets of light green hydrangea, lavender roses, and calla lilies. Congratulations to Danielle & Chad, your garden wedding was a dream come true. We are so happy we could help you make it all happen! 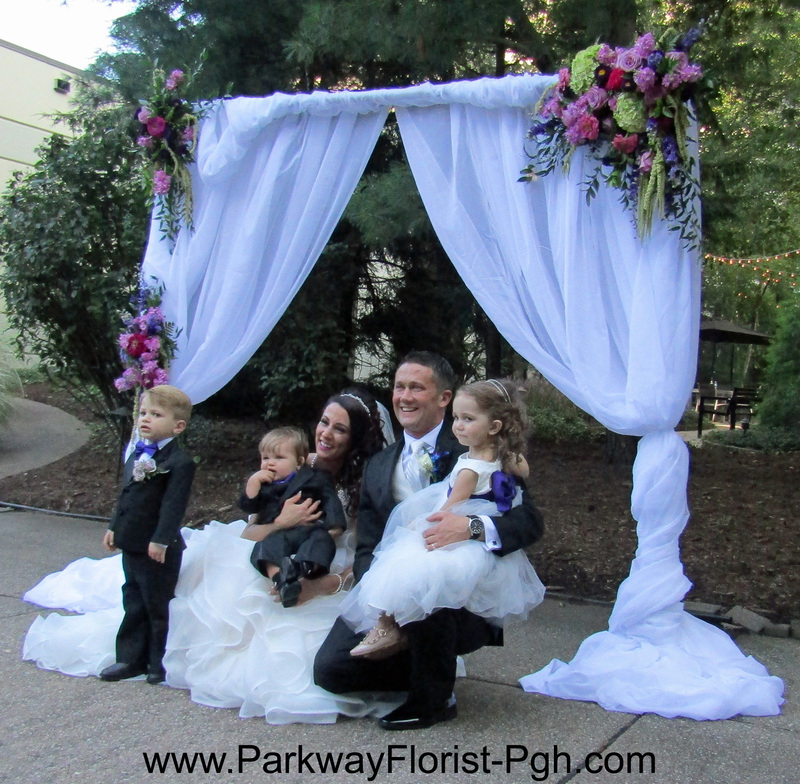 This entry was posted on August 22, 2017, in Weddings - 2017 and tagged Parkway Florist Pittsburgh Wedding, parkway florist wedding, pipe and drape, pittsburgh airport marriott wedding, Purple wedding, purple wedding flowers, wedding arch, wedding backdrop, wedding flowers pittsburgh, wedding props, wedding scenery. There’s nothing like the sight of lanterns at a wedding. 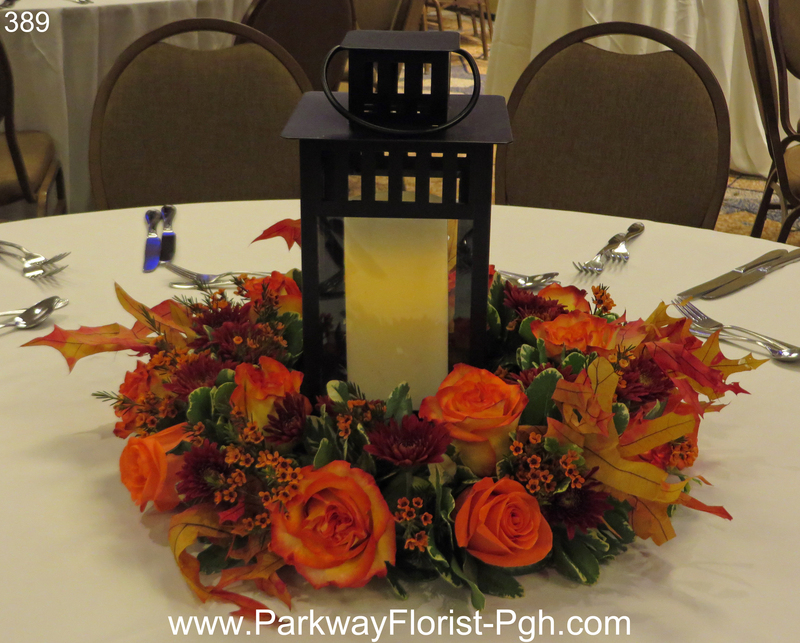 Pretty and whimsical, lanterns come in many styles, colors, and sizes. 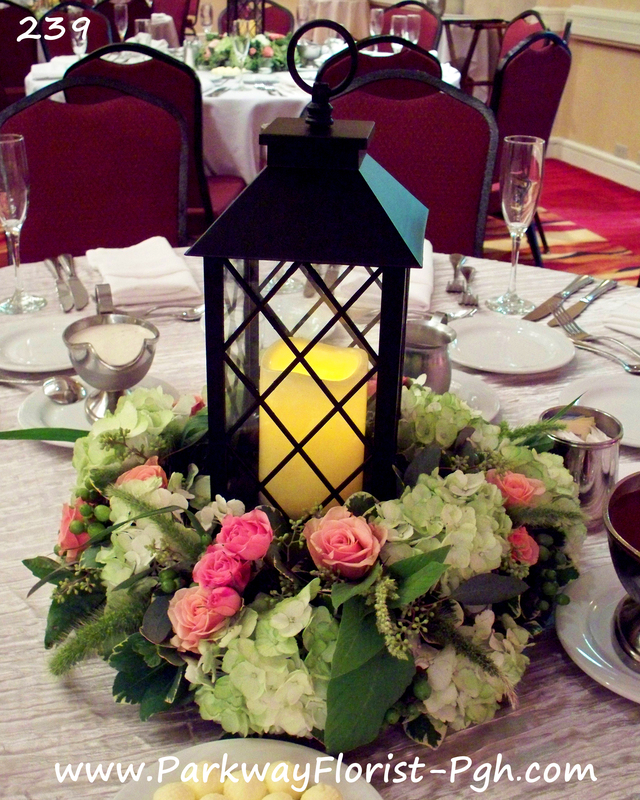 The romantic soft light of a candle glowing from within makes lanterns the perfect wedding decor item. Our wedding this past Saturday took this idea and ran with it. 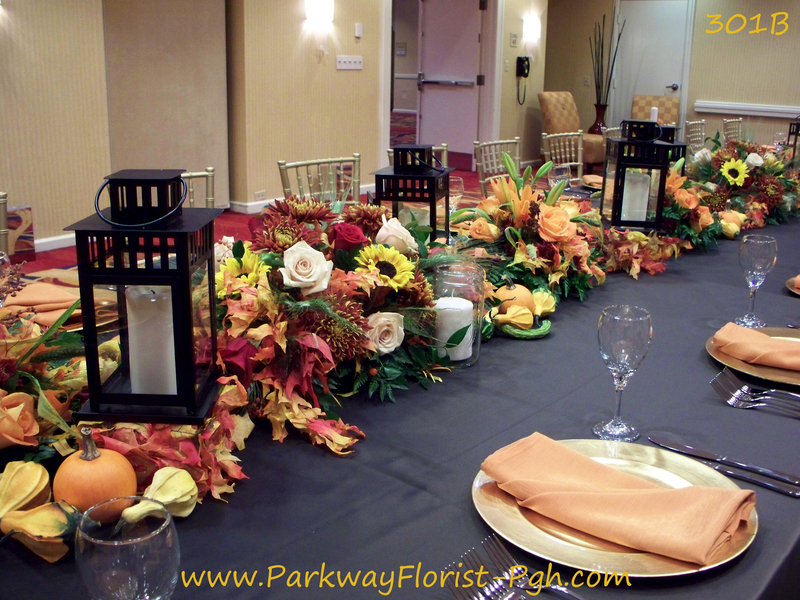 Lanterns were used throughout the ceremony and reception providing a consistent theme. 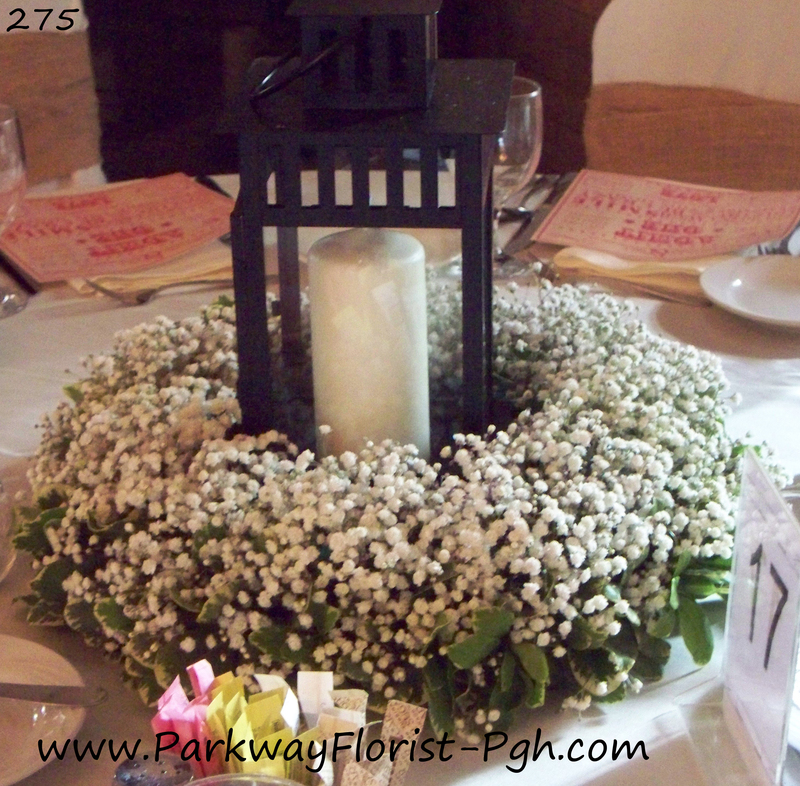 White lanterns were used on the guest tables as centerpieces as well as on the head table. 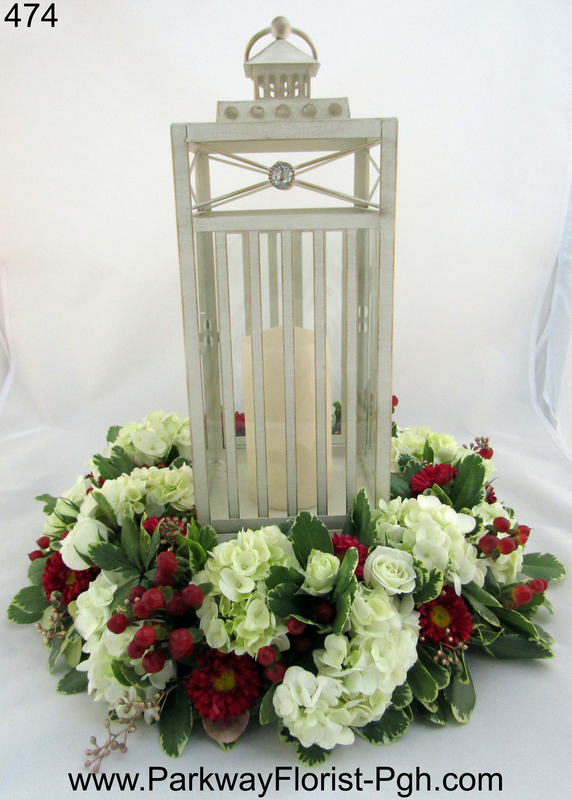 Topped with blush pink and ivory flowers, the soft elegant look really came together. The wedding cake was decorated with many of the same flowers from the centerpieces for the perfect soft pink touch. As with any trend, each person makes their own adaptations to fit their personal style and taste. 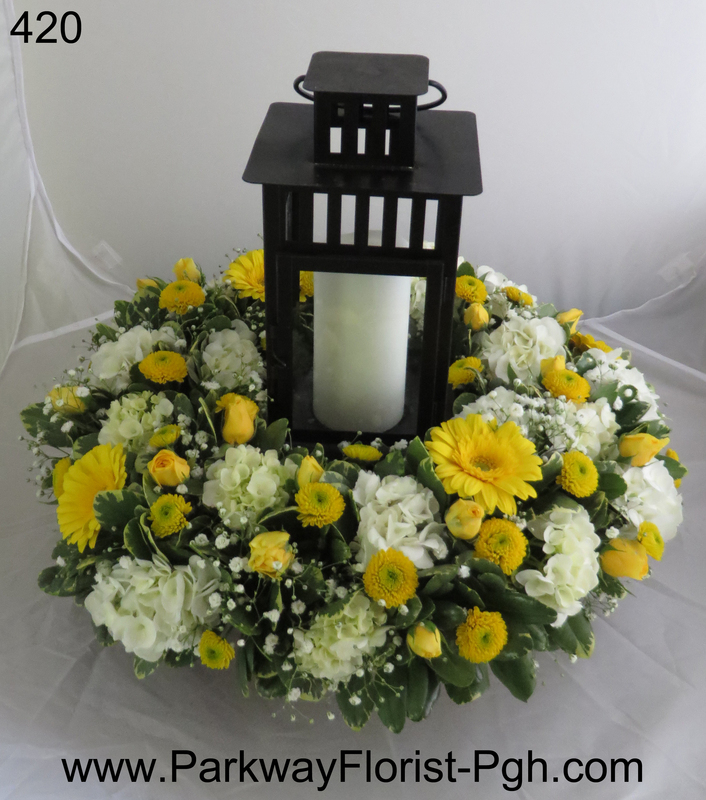 Below are some of the many styles of lanterns that we have worked with just in the past few years alone. You’ll see that each has its own distinct look. This is a trend that we hope stays around for a while to come! 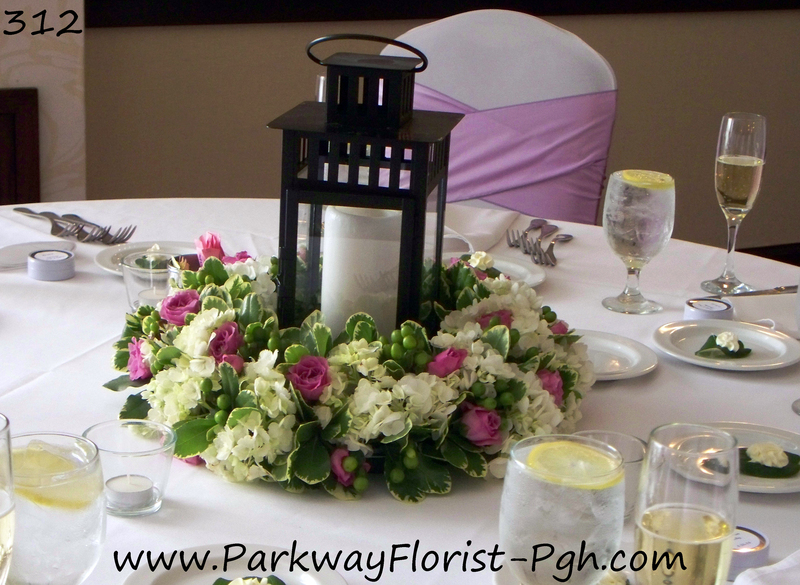 This entry was posted on July 11, 2017, in Weddings - 2017 and tagged blush and ivory wedding flowers, blush pink wedding, July Wedding Flowers, lantern centerpieces, lantern wedding, lantern wreath, lanterns, parkway florist, parkway florist wedding flowers, pink and white wedding, pink wedding flowers, Pittsburgh Airport Marriott, Pittsburgh Airport Marriott Wedding Flowers, Pittsburgh Wedding, pittsburgh wedding flowers, pittsburgh weddings, Summer Wedding Flowers, wedding flower lanterns, wedding flowers pittsburgh, wedding lanterns.